This work is roughly set with Conan being very young, possibly seventeen or eighteen. This is of course after the events of Venarium and finds our hero running with a band of raiders known as the Aesir. The leader of these raiders is Njal, who awakes to find that his daughter Rann has been kidnapped by Hyperboreans. Njal sends out thirty scouts to a castle called Haloga. Conan, Njal and a handful of raiders depart to recover Rann and also to discover the whereabouts of the missing scouts. In one graphic scene, we find that the scouts have been hung on hooks and displayed around the top of Castle Haloga. The perpetrator? A wicked queen called Vammetar and her sinister Witchmen. Conan penetrates the fortress only to find that the dead have risen and are on the hunt for the raiders. Interesting enough that the story ends with Conan in chains, a slave to the Hyperboreans. This "slavery" is shown at the beginning of the film "Conan The Barbarian" and also recalled in the next Conan entry entitled "The Thing In The Crypt" . Overall, I thought this was a decent read filled with action and occult. I am not sure who to credit the writing too... but overall it was a really good piece to fill in the young adult era of Conan's life. 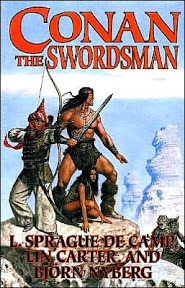 I am dreading the upcoming novels in the series by Conan hack Steve Perry.